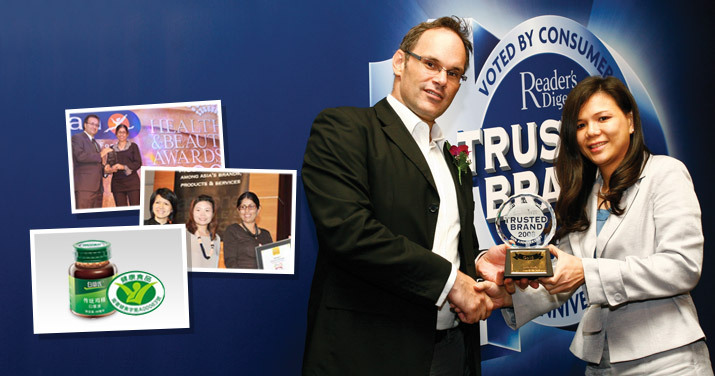 SINGAPORE, 26 April 2007 - Health supplements industry leader BRAND’S® was today awarded the Reader’s Digest Gold Trusted Brand in the vitamins and health supplements category. BRAND’S® has enjoyed a winning streak – receiving Gold Trusted Brand every year since the inception of the Award three years ago. Mr Eiji Koike, President & Chief Executive Officer of Cerebos Pacific Limited said, “We are extremely proud to get the Gold – third time running! I am personally thrilled to be part of a leading health supplements enterprise like BRAND’S®. This Award is especially gratifying given the range of brand attributes that were examined by consumers in seven markets across Asia. BRAND’S® is a winner with our credibility, quality, value for money, innovation in new products and over and above all with our unrivalled relationships with consumers that stretches for more than 170 years. This mix is unique to BRAND’S® and is our not-so-secret recipe for our success!" BRAND’S® Essence of Chicken, flagship product of BRAND’S® is the only product of its kind to have credible scientific studies published in more than 20 academic journals and conducted in nearly a dozen university research centres across the world. These studies demonstrate that BRAND’S® Essence of Chicken have a number of health benefits to consumers. A key focus for future research of the BRAND’S® Research and Development Division is to further understand the product’s ability to improve mental performance. Research highlights that consumption of BRAND’S® Essence of Chicken improves mental concentration, memory, and learning. While BRAND’S® Essence of Chicken has been one of the most popular products used by both young and old and has since achieved multi-billion bottle sales, the line of BRAND’S health supplements now include BRAND’S® Bird’s Nest, BRAND’S® tablet form health supplements and the BRAND’S® Innershine® and Children Range to meet the health needs of different life stages. The Reader’s Digest Trusted Brands survey is an extensive consumer survey conducted across seven countries in Asia annually, where over 7,000 consumers nominated their most Trusted Brand in more than 42 different product categories.